Eye in The Sky is a truly riveting tale about the cost of war, and the decisions that people must make on a daily basis deciding who lives and who dies for the price of freedom. In today's day and age, war is a constant. We send our troops out to various countries around the world and have to ask ourselves if the damages are really worth it sometimes. With the advanced technology that now exists in the military, some argue there are less casualties, but, in some cases, the opposite could be true. Gavin Hood's Eye in the Sky is a film that examines these issues, and the moral obligation we possibly have. Helen Mirren (Fast 8, Woman in Gold) stars as tough-as-nails Colonel Katherine Powell, who has been tracking the world's most wanted terrorists for years. After finally locating them in Kenya, the American and Kenyan military want to capture them and put them on trial. When they see that the terrorists decide to hold up in a Somalian home, the military decides that this now needs to become a mission to "eliminate" the problem. The film also stars Aaron Paul (Central Intelligence, Triple 9) as Steve Watts, a member of the American Military who does surveillance. He is approached to now become a trigger man for the military and kill the terrorists, but finds himself struggling with his ethics, as the situation now becomes more complicated with the presence of a young, innocent girl that finds herself in the area of the strike zone. The question now becomes is it "worth" it to kill the innocent girl in the attack if it means killing the terrorists and possibly avoiding the death of hundreds? Eye in The Sky also marks the final live action performance of the brilliant Alan Rickman (Harry Potter Series, Die Hard) as Lieutenant General Frank Benson, the military man in a room of bureaucrats who tries to convince them that the loss of one innocent life is necessary to save so many more in the long run. In pure Rickman fashion, he commands a presence on camera that is undeniable, and his stoic, unfeeling portrayal belies a pain few civilians can fathom. Director Gavin Hood (X-Men Origins: Wolverine, Ender's Game) does a great job with the material. Unlike his past few big budget films, Gavin was able to direct without much studio oversight and he was able achieve the film he wanted. The pacing, cinematography, and acting are top notch and he give a fitting tribute to the late Alan Rickman. Originally shot on digital video, Eye in The Sky has very little artificating. Blacks are spot on. Colors are muted and not too vibrant. Sharpness is a bit dull at times. Since the film is more drama than action, the audio is very front loaded. Presented in DTS-HD Master 5.1 lossless audio, the dialog is crisp and clear and the special effects (what little there are) are relegated to the rear channels. "Perspective" Featurette: Clocking in at 1:22 - Actress Helen Mirren, Director Gavin Hood, and Producer Colin Firth explain how the film serves as a mechanism for discussion on the moral conflict surrounding drone warfare. "Morals" Featurette: Another small featurette clocking in at 1:31 - Actress Helen Mirren, director Gavin Hood, and producer Colin Firth discuss the moral and ethical questions raised in the film. Eye in The Sky is a truly riveting tale about the cost of war, and the decisions that people must make on a daily basis deciding who lives and who dies for the price of freedom. Gavin Hood and the cast were truly amazing in this film and it is a must see for even the most jaded film connoisseur. 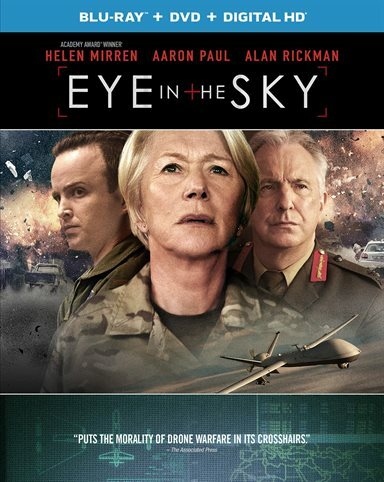 Download Eye in the Sky from the iTunes Store in Digial HD. For more information about Eye in the Sky visit the FlickDirect Movie Database.